This is where all the good stuff happens. Mumbai is the city of unique food and culture — there's always something new and interesting to try, and you'll never tire of it. So, we decided to do a round up of the hottest new places in town, that you simply have to visit. Inspired by the markets of Spain, El Mercado sits pretty in pink and decorated with brightly coloured art. Open from 8:30 am, this place has it all — all-day breakfast with mouth-watering plates that are meant for sharing with friends. Gambas Al Ajillo, Pimientos Rellenos, and the Croquetas. Price Rage: ₹1,000 per person. True to the Japanese idea of minimalism, Itzumi is clean and effortlessly cool. Coloured cushions accent the wooden and white tables. The tiny noodle bar, seating no more than 15, perpetually has a line. Forget Crème de la mer, this is clearly the miracle broth! Chicken Paitan Ramen, Edamame Crispy Sushi, and Pink Soda pop. 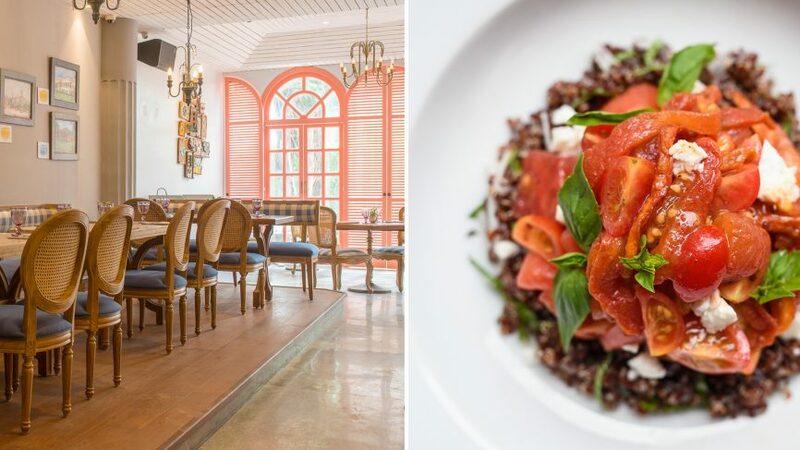 A new eatery, by the owners of Mumbai’s The Table in collaboration with the Wood Side Inn and BOMRAS Goa Teams, assures a unique experience indeed. With a lounge on the bottom floor and more relaxed seating on the top floor, Miss T caters to all kinds of tastes. Food-wise, too, they have managed to strike the perfect balance between Asian and European flavors. Quixotic Cocktail, Bomras Tomato Salad, and Char-grilled Spring Chicken. A Bengali and French menu doesn’t mean fusion in the case of this Goa eatery, which just opened its doors in Mumbai. This place has a dual menu to choose from. The food presentation is beautiful and uncluttered. The glamorous cocktails are a visual feast of colour, and complement the pastel furnishings. Sangria, Poached skate fish with brown butter, and Doi Began. Pali Thai feels like a portal into another world. Swanky and dimly lit, the ground floor is seductive. The upstairs is more brightly lit, with velvet sofas. From the precious flower petals garnishing the curries to the flavour-packed meat preparations, the intricate details in every dish exude Thai elegance.